Excavation of two quarries in Wales by a UCL-led team of archaeologists and geologists has confirmed they are sources of Stonehenge's 'bluestones'- and shed light on how they were quarried and transported. 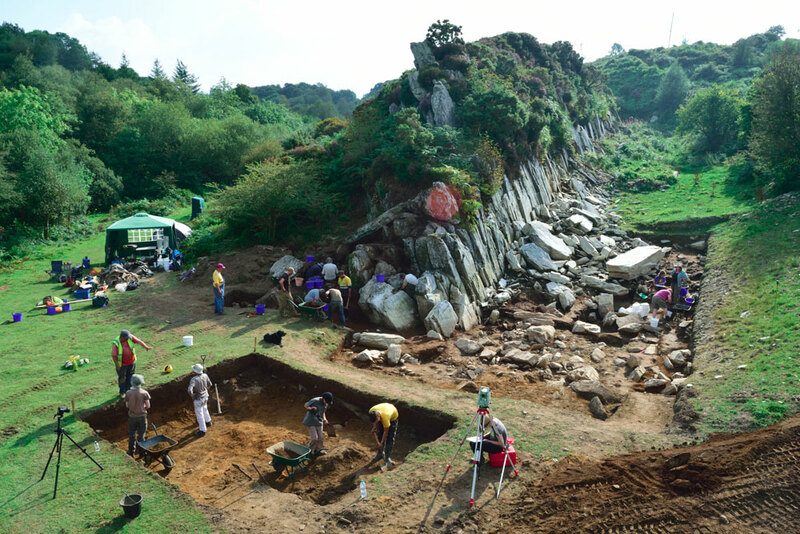 New research by the team published today in Antiquity presents detailed evidence of prehistoric quarrying in the Preseli hills in Pembrokeshire, helping to answer long-standing questions about why, when and how Stonehenge was built. The team of scientists includes researchers from UCL, University of Manchester, Bournemouth University, University of Southampton, University of Leicester, Amgueddfa Cymru - National Museum Wales, and Dyfed Archaeological Trust. The very large standing stones at Stonehenge are of 'sarsen', a local sandstone, but the smaller ones, known as 'bluestones', come from the Preseli hills in the Pembrokeshire Coast National Park. Geologists have known since the 1920s that the bluestones were brought to Stonehenge from somewhere in the Preseli Hills, but only now has there been collaboration with archaeologists to locate and excavate the actual quarries from which they came. Director of the project, Professor Mike Parker Pearson (UCL Institute of Archaeology), said: "This has been a wonderful opportunity for geologists and archaeologists to work together. The geologists have been able to lead us to the actual outcrops where Stonehenge's stones were extracted." The Stonehenge bluestones are of volcanic and igneous rocks, the most common of which are called dolerite and rhyolite. Dr Richard Bevins (Amgueddfa Cymru - National Museum Wales) and Dr Rob Ixer (UCL and University of Leicester) have identified the outcrop of Carn Goedog as the main source of Stonehenge's 'spotted dolerite' bluestones and the outcrop of Craig Rhos-y-felin as a source for one of the 'rhyolite' bluestones. The research published today details excavations at Craig Rhos-y-felin specifically. The special formation of the rock, which forms natural pillars at these outcrops, allowed the prehistoric quarry-workers to detach each megalith (standing stone) with a minimum of effort. "They only had to insert wooden wedges into the cracks between the pillars and then let the Welsh rain do the rest by swelling the wood to ease each pillar off the rock face" said Dr Josh Pollard (University of Southampton). "The quarry-workers then lowered the thin pillars onto platforms of earth and stone, a sort of 'loading bay' from where the huge stones could be dragged away along trackways leading out of each quarry." Professor Colin Richards (University of Manchester), an expert in Neolithic quarries, said: "The two outcrops are really impressive - they may well have had special significance for prehistoric people. When we saw them for the first time, we knew immediately that we had found the source." Radiocarbon-dating of burnt hazelnuts and charcoal from the quarry-workers' camp fires reveals that there were several occurrences of megalith-quarrying at these outcrops. Stonehenge was built during the Neolithic period, between 4,000 to 5,000 years ago. Both of the quarries in Preseli were exploited in the Neolithic, and Craig Rhos-y-felin was also quarried in the Bronze Age, around 4,000 years ago. "We have dates of around 3400 BC for Craig Rhos-y-felin and 3200 BC for Carn Goedog, which is intriguing because the bluestones didn't get put up at Stonehenge until around 2900 BC" said Professor Parker Pearson. "It could have taken those Neolithic stone-draggers nearly 500 years to get them to Stonehenge, but that's pretty improbable in my view. It's more likely that the stones were first used in a local monument, somewhere near the quarries, that was then dismantled and dragged off to Wiltshire." Professor Kate Welham (Bournemouth University) thinks that the ruins of any dismantled monument are likely to lie somewhere between the two megalith quarries. She said: "We've been conducting geophysical surveys, trial excavations and aerial photographic analysis throughout the area and we think we have the most likely spot. The results are very promising - we may find something big in 2016." "The only logical direction for the bluestones to go was to the north then either by sea around St David's Head or eastwards overland through the valleys along the route that is now the A40" said Professor Parker Pearson. "Personally I think that the overland route is more likely. Each of the 80 monoliths weighed less than 2 tons, so teams of people or oxen could have managed this. We know from examples in India and elsewhere in Asia that single stones this size can even be carried on wooden lattices by groups of 60 - they didn't even have to drag them if they didn't want to." Phil Bennett, Pembrokeshire Coast National Park Authority's Culture and Heritage Manager, said: "This project is making a wonderful contribution to our knowledge of the National Park's importance in prehistory." "Stonehenge was a Welsh monument from its very beginning. If we can find the original monument in Wales from which it was built, we will finally be able to solve the mystery of why Stonehenge was built and why some of its stones were brought so far", said Professor Parker Pearson. Craig Rhos-y-felin: a Welsh bluestone megalith quarry for Stonehenge' is published in the journal Antiquity on Monday 7th December 2015.